In my previous article, we discussed the development of Suspended Structures and the technical aspects involved in the construction of Suspended Structures. 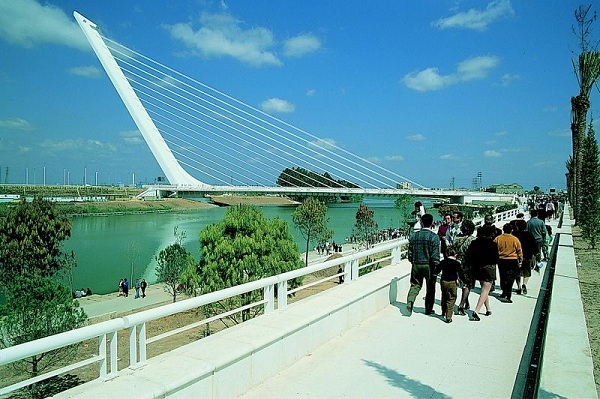 Alamillo Bridge, Seville, Spain, 1987-1992, designed by Calatrava Santiago, total span of the bridge is 250m and height of the tower is 142m. Materials used are steel for tower with concrete infill where needed, steel bridge deck structure and concrete abutments. The extraordinary weight of the concrete filled steel mast, which angles away from the roadbed at 58 degrees is enough to support the deck without the need for counter-stay cables or support piers. The mass and the bed of the tower exerts a backwards downward force while the cable stays and roadbed mass exert a forward downward force. The mass of the tower was so calculated so that its backward and downward force wouldn’t lift the bridge off the ground. For this reason, an additional mass was needed to counter the reaction of vertical forces. In order to increase the mass, the steel box girder of the tower and the steel deck structure were filled with concrete. This added to the stability of the structure. The joint formed by the meeting of the tower, deck and abutment near the ground was then cast out of concrete. Horizontal and Vertical forces acting on the structure have to be studied carefully. 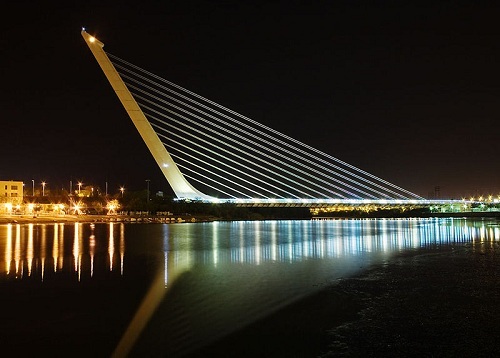 This structure is designed in such a way that the horizontal force component in the bent tower and the horizontal force of the roadway counteract each other so that the abutment only needs to resist vertical forces. Span of Bridge is only 200mm?? I want to Know whether I can raise the column over the beam projected 1mtr from the column to construct 1st floor. awsome sie. thank you for making this useful site ! these are very nice projects..